Sometimes bioactive charcoal is exactly what our skin needs, especially when we want to deeply cleanse face pores and get rid of the blackheads, to smooth the skin and make it look spectacular under make-up and in photos. The bioactive charcoal has gained popularity quite recently, when Internet users got crazy about home-made Korean charcoal masks. 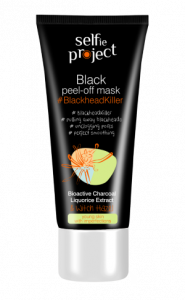 With the black peel-off mask by Selfie Project this treatment is much easier and does not require mixing of the ingredients like in the case of the do-it-yourself masks, which are usually very messy. 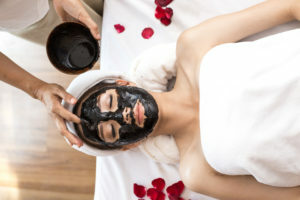 In addition to the charcoal acting like a magnet and absorbing all pore impurities, the peel-off mask is rich in many other botanical active ingredients, such as the liquorice root extract, which soothes the skin and relieves irritations, and the Witch Hazel extract, which gently but effectively cleanses and smooths the skin. All these components are completely natural and safe. The mask is very thick and sticky, thanks to which it tightly adheres to the face before it gets dry. The product is packed in a tube so it’s easy to apply and can be dispensed in small portions onto your hand or face. It’s a perfect solution for those of us who have problems with clogged pores and greasy skin. After application of the mask you will feel like in an Asian spa. It’s a unique treatment which, due to its intense effect, should be left for special occasions and applied from time to time only. Apply the mask over the entire face or only to problematic, greasy areas, which usually include the forehead, nose and chin (so-called T-zone). Leave the mask on for approximately 15-20 minutes (the thicker the layer, the longer the time) or until you feel it’s dry enough to be taken off. Gently remove the mask as if it was a plaster – starting from the chin and pulling the mask upwards. In case of any residue, wash it off with a cotton pad soaked with micellar water, facial gel or oil.